Henrik Ibsen’s canon of work spans a wide variety of themes and ideas. One of his most prevalent themes focuses on social and political change. Considered to be a masterpiece by some, Rosmersholm follows the story of widower John Rosmer as he supports the communities new ideas and his friend and occupant Rebecca West, who sets out to undermine his intentions. 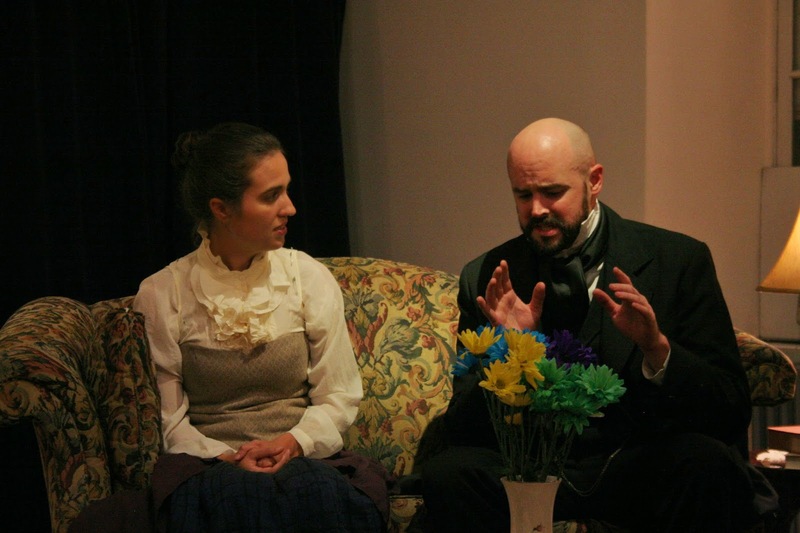 Adapted by Katherine C. McDonald, Ibsen’s story is in full bloom with a fresh voice. McDonald’s version keeps Ibsen’s story within the 19th and 20th century but brings modernity to the front. With that being said, the ensemble lived in different stylistic worlds. McDonald’s script verged between modern and heightened language allowing for some actors to take on the various styles. Despite the inconsistencies, the ensemble for the most part worked well off one another. Leading the pack was Philip de la Cal as John Rosmer. de la Cal balanced his beliefs and love for Rebecca quite well. His performance was strong and versatile. McDonald, who portrayed Rebecca as well as drafting the new version, lacked chemistry with de la Cal’s Rosmer, partially due to their varying approaches. Her performance had an aura of entitlement and was a bit out of place at times. The standout star of the production was the rarely seen but brightly shinning Jessica Mosher as Ms. Helseth, the maid. Mosher made great use of her role bringing quirkiness to the help. Additionally, Tristan Schaffer-Goldman brought some edge to the drama-starting Mortensgaard. Director Jennifer Sandella had a unique challenge of bringing the production to life in a site-specific environment. The Old Stone House evoked a wonderful classic feel, placing the audience into the sitting room of Rosmerholm. Sandella staged the piece in a way that allowed for the majority of the audience to have a great seat. Of course the restrictions of the space prevented this at times, especially during Act II for those seated on the sides. As previously mentioned, the various styles the actors brought to the piece were not meshed as well as Sandella could have done. The scenes featuring de la Cal’s Rosmer, McDonald’s Rebecca, and Mike Gregorski’s Dr. Kroll, de la Cal and Gregorski played up the heightened world while McDonald felt misplaced with the more contemporary approach. Had Sandella bridged the gap, the scenes may have been more cohesive. The costumes by Anna Grace Carter were simple and appropriate to the time. Olivia McGiff as the set and prop designer did a fine job with the exception of the flowers. The flower color pallet lived in a completely different world than the rest of the set and costumes. They were so jarring, they drew attention. Rosmersholm may be one of Ibsen’s lesser produced works yet is still one of his stronger stories. Random Access Theatre’s production at the Old Stone House was sublime and was a great fit for the location. The play is certainly a thought-provoking piece for the time.